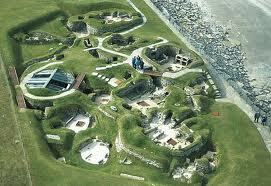 Skara Brae is the place Orkney is famous for. It is a 5000 year old late Stone Age village, stone-built in a refuse heap, overblown by sand dunes and then remarkably preserved for posterity. A steady stream of visitors is welcomed every year in its all year open visitors center with a replica of one of the houses (7) next door. Skara Brae speaks to the imagination and is one of the best preserved villages of the Stone Age and the best of Western Europe. World-heritage of course. Skara Brae eclipses the real gem of Stone Age Orkney, Maeshowe, which is hardly known in the wider world, but which at least rivals if not surpasses Stonehenge in cultural importance. 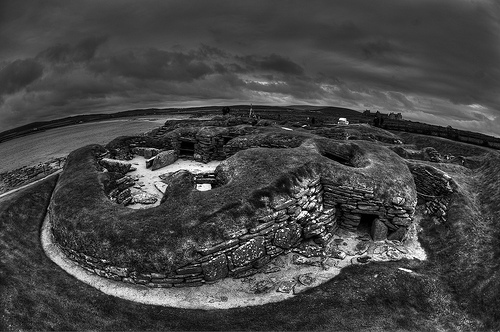 Skara Brae though owes its significance to the fact that it gives us a glimpse at everyday life in that late Stone Age era in Orkney around 3000 BC, which saw the emergence of a highly sophisticated culture on the fringe of Atlantic Europe. How big SkaraBrae was is not fully clear but it was built inside an old refuse heap, a kitchen midden. These middens near the sea are usually associated with a (semi-sedentary) Mesolithic lifestyle, with heavy dependence on the sea as food source. Huge heaps like Skara Brae may be a thousand years accumulating, the longest, in South America, is 11km long building up over thousands of years. Whatever the age of the midden, the reason to build inside a, no doubt stinking, refuse heap must be weighty. So why bear the stench? And the answer is: insulation and stability. We see here convincingly how important the insulation of the housing was, not to mention the safety, and how the same principles and techniques, used in the huge, highly insulated, megalithic refuge chambers (wrongly deemed tombs), were used here as well. The midden material happens to be an excellent insulator and became used extensively in double walls of houses and refuge chambers. The existence of the ‘Watch-chamber’ is to my knowledge never mentioned by archaeologists but is a definite fact in old plans (Dryden 1879). 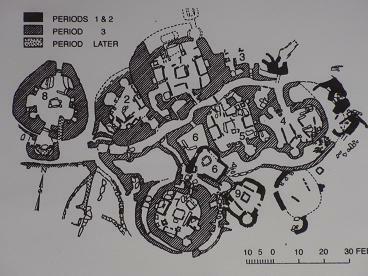 These sketches clearly show a walled structure with a seat built over a drain (parallel pointed lines) coming from the corner-cell of House 1. The building opens to the north. This building was not aligned on true north, maybe magnetic north, but its ‘misalignment’ could well have to do with the ancient pole star Thuban, Alpha Draconis, which is rather closer to the centre stars of the Great Dipper (Ursa Major = Great Bear), than the present pole star. By implication this means that the Great Bear was circling the pole star Thuban much closer and more obviously in those days. Already only this spectacle would draw astronomers/cosmologists to the far North and it also may have given them a clearer hint that not the stars, but they themselves were moving in a circle. The strong visual pattern of the Great Bear with 7 and the Little Bear opposite with 2 bright stars circling the pole star Thuban may have been the inspiration for several carved stones of the period. 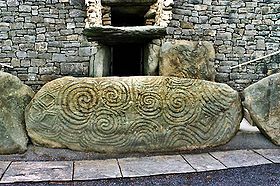 Entrance stone Newgrange ( 1.80x.60x.60?). 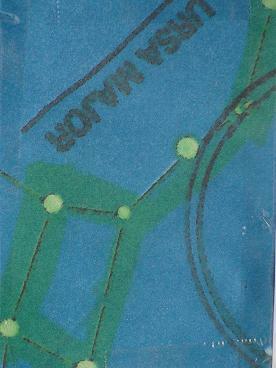 Maybe the straight line in the middle is also the connection between the two right-hand spirals, it would indicate the direction of the pole star Thuban if the Great Bear is depicted here. They may have seen the constellation as two figures, one of three ( or two and one ?) and one of four stars, plus two stars for the Little Bear. Pierowall stone , Westray, Orkney ( 1.5 x.45x.30?) Note double two spirals is four on the right and two plus one (far left, halved) is three, the pole star would be the dot in the lozenge in the middle, with 4 cardinal points. Eday Manse Stone, Eday, Orkney, again the connected spirals, see the fifth half spiral, which comes to the number 5 of the W of the constellation Cassiopeia opposite the Great Bear. The left concentric rings may then be the symbol for the pole star Thuban. So how would they have used the Watch-chamber as observatory? Let us have a closer look at the plans seen through the eyes of antiquarians one and a half century ago. Below the Watch chamber, again, in relation to the village, it was probably embedded in the midden around the house and outside the village, the open path (called Market place now) was running past it. This positioning reminds one of the magnificent Hag’s chair which is a curb stone at Cairn T, Loughcrew, Ireland, also facing north. Central Cairn T, Carnbane East, opens to the east and was no doubt a cosmological centre for a rather large community. 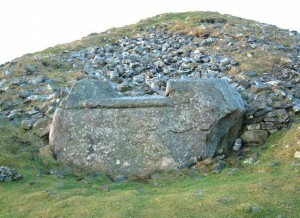 (Central Cairn L, Carnbane West, the delivery room). We can imagine the cosmologists being the Time-keepers for the whole agrarian community in their neighbourhood. Predicting the proper time when to sow, so as not to be misled by a false spring, or when to begin the harvest was vital, they no doubt were also excellent weather forecasters, knowing subtleties in sky and nature foreboding weeks ahead, knowledge that present-day meteorologists have no idea of. The calendar was of great importance for a good yield, but then some people had to keep the count, the record and do the forecast. Time-keepers you find in many ancient agricultural societies. The idea is that the watch-chamber was the place of the keeper(s) of Time but it is in this case definitely linked to House 1, although only because of the drain. See the drain starting in the corner-cell and going exactly underneath the central feature in the Watch-chamber which is called ‘anvil’, so must have been a flat stone of about 25cm squared and some height, but it is for an anvil strangely placed over a vulnerable drain. It could have been a stool for the actual observation, because the pole star is high in the sky in Orkney, the back seat a ‘warm’ place to wait for the right moment to observe, but it could have been just a small rectangular table, to put up an instrument or arranging and counting pebbles; it would, when removed, open the drain. It even seems the drain is bent towards the ‘anvil’ so as to go straight underneath it, which means that the orientation of the chamber was planned and the drain had to pass under the anvil, whatever its use . 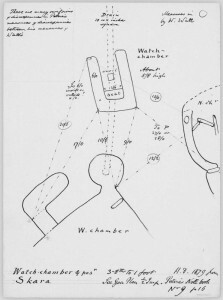 This is the most detailed plan of the Watch-chamber. 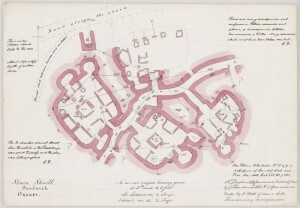 (On the pink plan the drain is straight lined and slightly differently positioned, not in line with the chamber and the rather square stone, as on the detailed sketch below (same author)). H.Dryden, 1879, detailed drawing of side cells House1 in relation to the ’Watch chamber’. Whatever the case, the Watch-chamber was built after the drain was laid and was definitely conform the planning of House 1, thus contemporary. The inside of the chamber is 1.85m long and 0.75m wide (which is 5 by 2 fibula of 37 cm). So it is a deep narrow space for only one person to sit in, with a view which is framed by the walls and the probable roof of the chamber and thus shows only a limited segment of the night sky to the north. It maybe that the view could exactly be limited to the passing of the Great Bear through its western segment, so that the pole star was held at the right hand out side the wall while the constellation passed through the full opening. 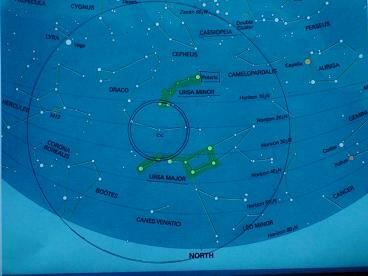 In fact the Little Bear (Ursa Minor) would circle directly opposite the Great Bear, because Thuban (Alpha Draconis) lies exactly in between the closest and brighter stars of the two constellations. This way the seasons could be tracked by the disappearance of constellations and appearance of others in this window on the universe. The time it takes stars to appear and disappear in the frame could be counted by taking the pulse and by pushing pebbles from the table, every five or seven beats, which then later could be arranged and counted. (see implements below). The 5-star W of Cassiopeia, today rather opposite the Dipper, would go low over the horizon and through the window, when the Great Bear was rising high in the northern sky. Nothing tells us more about the sophistication of Skara Brae than its carved stone balls and its carefully finished enigmatic implements. 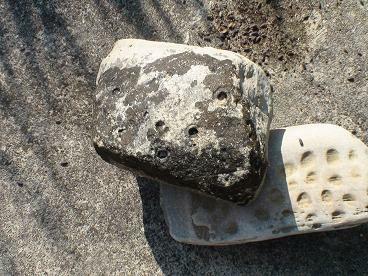 We see here three different types of stone balls in one cache, all from Skara Brae, the left one is hardly a ball, but more of an implement, but it has the same design ‘four-point’ on either side as kind of axis, as the knobbed ball has. The number of ribs and grooves seems significant here, 5 ribs with 6 grooves vertical, 5 ribs 4 grooves horizontal. I am tempted to say this has mathematical meaning at least it is 11 + 9 = 20 = 2 x 10 ribs , this twice is 40 plus 2 x 4 on the ends, which are slightly mis-aligned, is 48, which is 4 x 12. A lot of numbers are expressed on this implement and that just by grouping certain characteristics and, may be mark them with different colors paint, these would fix certain numbers. This does not exclude the possibility that the implement was still used for something totally unrelated to counting by patterns, but it could for instance very well be a ball to strap a string around and make a pendulum from. They no doubt used pendulums for water divination and what have you ( or as I claim to keep the time) It could be a weight to a floating fish trap (like in Denmark, I read). 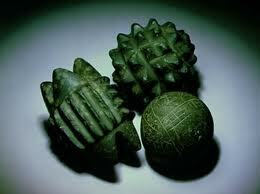 In any case over time the balls became highly stylised and geometrical and can be characterised as prized works of art. What strikes is the perfection of the forms ( the perfectly spherical ball), the evident symmetries in numbers and design; they are typically not ceremonial, but for use. The knobbed ball has as far as I have been able to make out, two cruciform end-fours like the other implement, marking an axis, then a circle of 9 knobs either side and then three rows of 13 in the middle, together (2+3) x 13 = 65 ( 4+9=13). The thing remarkable is the numbers 4, 9 and 13, 4 and 9 as square numbers and their sum 13, which as we have seen functions in counting for important moments in the calendar, since 9 x 13 = 117 + 1 = 118 = 4 lunar months of 29.5 days and also 4 x 7 x 13 = 364 + 1 = 365, the days of the year. The number 13 is often found in the Hebridean stone circles, like Callanish. 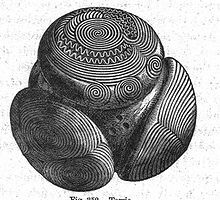 I had this idea they could roll this ball to make regular indentations in a clay surface, like you find them on the plateaus around Maeshowe-type chambers, these impressed patterns in the clay could then be filled with pebbles to design numbers. I think the clay surfaces around the chambers which were no doubt applied to keep the surroundings of the cairn from soaking up water, that these clay surfaces were used to draw figures in, make calculations on and keep records by. Even the Greeks used pebbles to count and had no symbols for numbers. 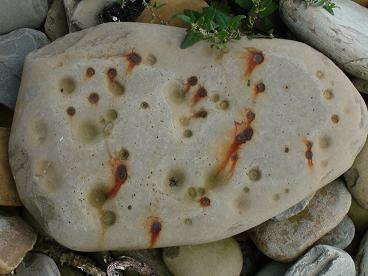 The word ‘calculus’ means ‘pebble’ in Greek and is directly related to ‘calculating’ with pebbles. Most stone balls like the above ribbed ones seem made to strap string or rope around and the idea that they were originally hunting-weapons as sling-shots or in the style of the bolas or boleadoras used in Spain and by South American gaucho’s, is attractive. 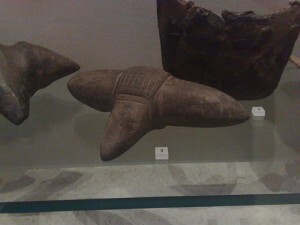 Boleadoras, thrown to entangle the legs of a fleeing animal, possibly also used for reindeer and birds in the Stone Age. My standard approach is to consider first of all the possible practical use of anything Stone Age people did and made. 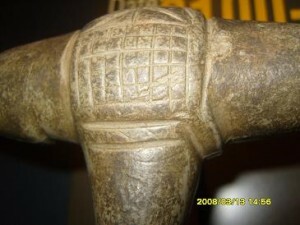 Since Spain has a definitely unbroken cultural Stone Age connection I think this is indeed a strong possibility for the origin of the stone balls, which became more and more stylised over time, like other utensils did in their culture; polished axes and mace heads testify to that. The principle of the sling-shot hunting gear may go back to the reindeer hunt, thousands of years earlier. The fact that the balls are usually found out of any context in the wild, except in Skara Brae, tells us that they were carried around and may often have got lost in the hunt, for example. It could even be that they eventually became a kind of sport: who could throw the furthest or aimed best on moving targets. The early many knobbed balls from Orkney, got replaced by new, simpler designs with less and less knobs, it seems, but always with symmetry, which is the extraordinary thing about them, the geometric symmetry they all seem to have and of course the standard size, which shows convincingly that the same measure was used over large areas and had probably a pratical origin or meaning. It could be for divination, for playing dice, or some other ball game. So there is more to them, because here the number of knobs is certainly not a whim but defines the whole geometry of the ball. So we see here a definite relation between a number and a very sophisticated geometrical figure and we can infer definitely that they were very much aware of that. 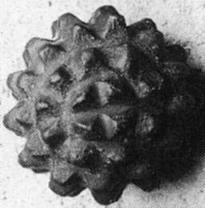 The ball with many knobs from Skara Brae must be considered an early one, and there are other examples, less ball-like, with knobs found there, so it is almost sure the thing had in origin a practical use, which may well have been hunting, fishing or pounding harvest or maybe meat to make it more tender. At the same time its neat rows of ribs or knobs show definite combinations of crucial numbers like 4, 9 and 13, or 9, 10, 11, so they may have been calculators as well, say, when not in other use. The stone balls of Skara Brae belong to the earliest and are definitely embedded in its time set, so Orkney is a good contender for the place of origin of the idea of (perfect) balls, given its scientific environment. The peculiar thing about the more stylised balls is their geometrical regularity and association with the 5 Platonic solids. The regularity of these designs is perfect, so a lot of effort went into achieving these results. It is as if the practical use becomes subordinate to the geometric design. Balls with six circles (cube) are predominant, but all kinds are found, with up to 160 tiny knobs. The balls mostly have the same standard size of about 7 cm (quarter ulna = 6.55 cm) , about the size of a tennis ball and sometimes seeming similar to its curved design. 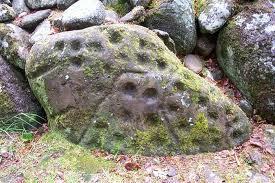 The stones can be exquisitely carved (below), note the spirals reminiscent of the neolithic stone carvings, note also the 3 small ‘cupmarks’ between the circles. This stone is obviously not made for intensive use, but as an object of art or divination. To assign it ceremonial use has no ground, people carried polished stone axes and mace-heads, maybe like today’s people their Rolex or handbag, but it may also be they just liked to make or have beautiful things without any status or use attached to it. The three small cup-marks in the hollow of this well preserved stone ball may very well derive from cup-marked stones, which in my view can be associated with numbers and star constellations. Stone Age people may have believed, as archaeologists do today, that these cupmarks were man-made, but they probably knew better, because most cup-marks are not man-made, as will be shown. It is another long-standing fallacy in archaeology that cup and ring marks are deemed man-made ‘decorations’. At the beach of Skara Brae you can find hundreds of cup-marked stones, even in different stages of development. The cup- and also the ring-mark are the result of natural processes of erosion and the stones were chosen, possibly because of their striking patterns or numbers; but not all were chosen, because there are so many of them and we would find more of them in the buildings if any cupmark arrangement would do. Cup- and ring-marked stones from beach Skara Brae. It is those stones that hold traces of iron ore in them that develop cup-marks once the metal grains get exposed at the surface, due to the erosion by the breakers, and subsequently start to rust. Every tide fresh salt water is added and exposure to oxygen in between. So the rust kernel starts to grow. Rust is strong, it can press a rivet out of the hull of a ship and a centimetre of rust is a millimetre of iron, so it expands by factor 10. As soon as the grain of iron ore is touched by the salty sea it starts to expand and crack the stone around its rust-core. It widens the hole and by expanding steadily creates a hollow, out of which the last grain of rust is eventually washed away. Pictures show this convincingly, also the ring-mark can be formed in this process (by interrupted exposure?) but does not occur very often. (see more photo’s at heading ‘Creation of Time’ : ’Cup- and ring marks’). A stone with cup-marks stands out, just because the marks seem to make patterns or are in rows, and the precise regularity of the concentric, perfect ringmarks is fascinating, so the cup-marked stones were actually chosen by Stone Age people because of these enigmatic symbols, which can be seen as numbers, but also as resembling constellations of stars. At Clava there is one standing curb stone left as begin of the entrance, which has a near perfect Little Bear arrangement at summer solstice, but is just natural. On rare occasions the cup marks are taken as the basis for other engravings but this happens seldom, as on the stone above, usually the cup-marked stones are untouched by chisels and were chosen for what they were, stones with a number, whatever it was, or with a star-formation, which they had, or had not yet, found. So the cup marks may relate to the carved balls because of their number, or their pattern. The fact that the stone balls are predominantly associated with the Recumbent Stone Circles (RSC) of Aberdeen-shire, north-east Scotland, points to a scientific environment (caches of counting pebbles!). The horizontal flat surface of the recumbents could be used as tables to arrange number patterns. 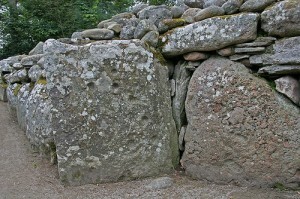 This culture, in my view, is directly descendant from Orkney where the Maeshowe culture seems to have suddenly vanished, but most probably continued due south in Aberdeen-shire well into the Bronze Age; also the distinctly well-ordered Clava cairns are prominent in this area, one having the same type of bended knee stone as Stenness. All after Orkney’s heyday. I wonder whether a relatively sudden sinking of Orkney would have occurred wedged as it is between the heaving Scandinavian and Caledonian landmasses which were again relieved of a pack of ice, causing rising sealevels as well. Orkney is criss-crossed by fault lines itself and close to an even bigger cluster of fault lines in Shetland, it has no raised beaches like western Scotland, instead it has sunken beaches and could have drowned in a relatively short period; anyhow vast stretches of Maeshowe culture’s agricultural land in the loughs around Brodgar and the even bigger area in the Bay of Firth (Finstown Bay) near the exquisite and huge refuge chamber of Quanterness, would have gone lost, so they could not survive on Orkney anymore and left for the fertile grounds due south in Aberdeen-shire, 80 miles by sea. This could explain the abandonment of Skara Brae where big valuable pottery vessels were left behind, impossible to take on a long journey. Another feature of Skara Brae is its Grooved Ware pottery where we see in fact the cup marks return as positive knobs of the straight edged vessels. Again the association with numbers is easily made. 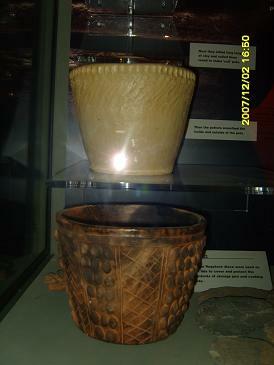 In general the grooved ware pottery seems more ’scientific’ because possibly for the first time ’grog’ was used in the clay to make it resist higher temperatures. Also the flat bottoms and straight walls make their vessels resemble Orcadian standing stones in profile, but they indicate most of all the use of flat-topped tables, like the renowned ‘dressers’ of Skara Brae. Traditional round bottomed ceramics was used on the ground and in fires, but is unstable on flat tables. This flatness we see in the recumbent stones, which were exactly horizontal, 2 metres long and over. This carefully shaped implement of which use or symbolism is unclear, is important in a mathematical sense for the rectangle of 7 x 5 squares carved on one side. This rectangle appears to have an additional square in the lower right hand corner. This geometrical arrangement of numbers expresses the mathematical truth that in any sequence of three natural numbers the product of the ‘flanking’ two numbers plus 1 is equal to the square of the middle number. So in our graph it shows the product of 5 and 7 as a rectangle of 35 squares and adds 1 to include the square of the number 6 in 36. The 6 is itself created by adding to the side 5 +1 = 6, and taking 1 from the side 7-1 = also 6. The 36 can be related to 10 x 36 = 360, which was often the way the year was counted, plus 5 or 6 days. In the drawing (below) figure A is supposed to be a rendering of the incisions on the implement, but it is an example of the sloppy rendering of data, it shows, left, a (wrong) grid of 6×6, which is even corrupting the straight lines of the original (but who cares in archaeology, its just decoration!) the same holds for the other carving over the top which is reminiscent of the inscription on the slab of house 7 in Skara Brae. Yes, an inscription, because the carving D is indeed the most convincing instance of the possibility that they may have had a script, which is another sign of the scientific sophistication of Orkney. It is possible that the same symbols are used on the stone slab as on the implement, but for that you have to properly investigate the real thing in both cases, because the professional drawings are worthless in that respect. The real thing, though, is behind glass, in the museum and difficult to get into your hands to examine. With this possibility of an early script (why ‘proto’-writing?) 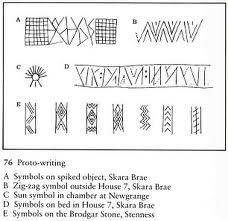 in Orkney, which resembles Runes, I conclude this first assessment of Skara Brae.